Often during this project I have had feelings of regret that I am no longer the spritely free spirited young adult I was. Being unemployed meant I had ample time to sit around and listen to music. Being single meant I could listen to music whenever I wanted. Living in a flat on my own meant I could crank up the volume to annoy the neighbours with nobody to tell me off. But also because there was little in the way of access to new music for me meant that I could invest time in any new stuff that I was presented with by friends. Sadly, Scream Silence weren’t around when I was in my twenties. Had they been so, I may have invested the same amount of time in listening to their music as I did with the likes of Dead Can Dance and Chris Issaak. Instead, in my early forties, I find it difficult to focus on an album in its entirety. Usually I have to put myself in a situation where I can’t skip tracks or turn it off but with Scream Silence I listened to the album in its entirety and, surprisingly, enjoyed it while yearning for those days where I could listen to whatever I liked whenever I liked, free from employer and commitments. It’s crucial to remember from previous Scream Silence appearances on the Music Project, that I had only been keen on one song prior to obtaining their entire discography so that must say a lot about them. I really wish the singer would take some elocution lessons though; his accent is quite distracting. 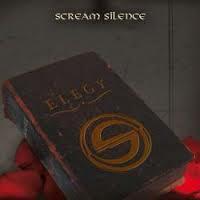 Elegy is Scream Silence’s fourth studio album.